At home, our vegan cooking is based on seasonally fresh fruits and vegetables, homemade tofu, and the basic idea that every ingredient should be savored for its special qualities. Our vegan pizzas are freshly baked crusts topped with pesto, tomatoes, broccoli, and mushrooms. 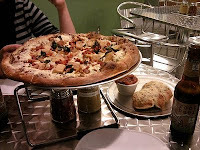 Recently, we discovered a remarkable Vegan Pizza restaurant close to Boston - Peace O'Pie, Gourmet Vegan Pizza in Allston. This is not a pizza joint with a veggie pizza. It's an entirely Vegan restaurant owned and operated by vegans. Fresh, organic produce is the core of every Pizza. There are no refined sugars. Even the whole wheat crust and pizza sauce are organic. We recently had a great Hawaiian Pizza and The MD (herb roasted onions and zucchini). The "cheese" used is Daiya, a wonderful food made from tapioca flour and ground peas that tastes and stretches like Mozzarella. Even the building is eco friendly - the counter front is bamboo, the ceiling tiles are recycled, and the countertops are made from PaperStone. I highly recommend Peace O'Pie for vegans and non-vegans alike. It's pizza you can feel good about. Thanks for recommending this place. It's very difficult to find vegan/veggie pizza but this one seems to be a place that we've been waiting for..
How can they match "pesto, tomatoes, broccoli, and mushrooms"? Rather try "pesto+chestnuts+pine seeds" or "broccoli+raisin+chili". Thanks for the wonderful review of our new establishment! We're always excited to learn that someone knows about us and wants to share that knowledge with the world. Hope to have you here again soon. Next time I'm in the Boston area, I'm going to look for this place. My family has tried this establishment and LOVES it. Don't forget, the vegan desserts are also first rate -- especially the cupcakes! I will probably give this a try! Thanks a lot for the review. I have been searching for new places to eat! Wow, the Peace O' Pie sounds amazing. Next time I get to Boston I'm going to have to check it out.